FKKMK-UGM. Fasting is not a barrier to doing activities. Precisely by doing activities, can be an important point to maintain fitness and balance the condition of the body during fasting. In essence, during fasting it is permissible to reduce activities, but don’t do any activities. Fasting services are run for approximately 12 hours without eating and drinking. Limp, hunger and thirst can hit. However, activities must continue. It is precisely in this service, it is recommended to continue to do good and gain merit including working as well as possible. “Various health studies now, fasting is good for health if done properly. 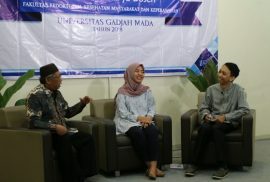 This talkshow is a form of institutional concern to provide an understanding of how to do activities and manage your diet during and after fasting, “said the Deputy Dean of UGM Research & Development, Faculty of Medicine, Public Health and Nursing (FKKMK), dr. Yodi Mahendradhata, MSc., PhD., Thursday (31/5) when opening the Talkshow. Body backup when fasting is extraordinary. This statement was expressed by physiology medical expert, Dr. dr. Zaenal Muttaqien Sofro, AIFM when starting his presentation. “Sports do try to mobilize food reserves, but watch out, many fasting people ignore water intake. For exercise, we must realize whether our hydration is sufficient. If you have, exercise can be done 2 hours before breaking the fast or 2 hours after breaking the fast, if we feel less hydration, “he said. What are the sports requirements for a fit body? This medical expert in Austrian graduate physiology adds that there are three things that are considered when exercising to make the body fit. First, it involves large muscles, both lower and upper limbs. Second, the movements must be rhythmic rhythmically. Third, continuous or continuous movement. Some sports that are recommended include: brisk walking, jogging for those without knee problems, static cycling, gymnastics or swimming. “Good exercise is to give the body a chance to rest, a week of at least 3 times, a maximum of 5 times. The principle of Frequency, Intensity, Time and Type (FITT) is important to pay attention to, “he added. The human body is principally divided into three, namely under the diaphragm, above the diaphragm and limbs. What works is the body above the diaphragm; while what is often problematic is the one below the diaphragm. “Managing body parts above the diaphragm can be by breathing exercises, vocalization, and posture. Tadarus Al-Quran, prayer, can maintain human health. Through tadarus, there is movement of the jaw directly to the brain stem associated with the heart. Respiratory too. While the prayer movement will change blood pressure, and it will be monitored for its relationship with the 9th and 10th nerves, also directly to the heart, “doctor Zaenal. Then what about nutritional nutrition? Health nutritionist, Dian Caturini Sulistyoningrum, B.Sc., M.Sc emphasized that water plays an important role during fasting. To regulate the hydration of water, Dian Caturini revealed that 2 cups at the time of opening, 4 cups between tarawih or before going to bed until sahur, and 2 more glasses at the time of sahur being the minimum standards required. “Consuming foods that are rich in water, such as fruits and sauces, can also support water hydration efforts,” he said. Dian Caturini in her presentation also said that during fasting, you should consume water as pure as possible. “Coffee, as much as possible reduced or minimized. The nature of the coffee attracts more fluid in the body, as well as soft drinks, sweet foods, and starch. “The food is empty calories, meaning it is consumed fast but does not feel full and high in calories,” he explained. For certain health conditions, such as pregnant women, the elderly and even people with diabetes and gout, for nutritionists it is not necessarily recommended to fast. “They need arrangements when fasting and under expert doctor consultation,” said Dian Caturini. Nutritional problems in Indonesia are now increasingly complex as the current global changes affect the culture and diet of some Indonesian people. On the other hand, not a few people still have a level of knowledge about low nutrition and lack of awareness in healthy behavior. One of the important factors that influence the success of efforts to improve nutrition and change healthy behavior in the community is the availability of qualified and competent nutrition workers so as to be able to provide clinical nutrition care, good education and exposure to the community. 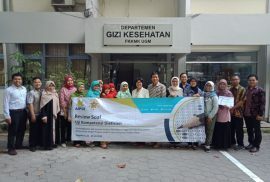 However, the complexity of nutritional problems in Indonesia is certainly different from the nutritional problems that occur in other countries, so since 2016 with the aim of introducing to foreign students related to nutrition problems that occur in Indonesia, especially Yogyakarta and shows how the role of nutritionists in the field of clinical nutrition, the community and institutions in providing nutrition care in hospitals and communities. The FKKMK Health Nutrition Department organizes an Elective Program entitled “Introduction to Nutrition Problems in Indonesia”. At present, foreign partner universities that have participated since 2016 are Flinders University Australia. 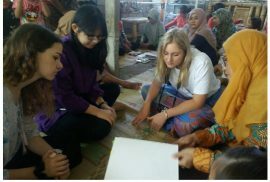 The activity which took place from April 21 to May 12 2018 was attended by two students from the Nutrition and Dietetic Flinders University who had completed undergraduate education and would take professional education. During the program, Flinders students get 12 times in class lectures from the Nutrition Department lecturers. In this activity students get knowledge about the results of research and community service to UGM nutrition lecturers related to nutrition issues in Indonesia. In addition, they also attend clinical and community placement. In clinical placement activities, students were invited to visit the UGM Hospital to find out how the role of RS nutritionists in providing clinical nutrition care to patients, besides that they were also invited to the hospital tour. Flinders students also have the opportunity to visit RSUP. Dr. Sardjito, they observed the planning stages until the preparation of the patient’s diet menu at the RSUP Nutrition Installation. Dr. Sardjito. They were also invited to the RSUP International Cancer Center (ICC). Dr. Sardjito who has been serving patients since 2015, where ICC is expected to provide better plenary services to patients, especially cancer patients. During this visit, Flinders students interacted directly with patients at the ICC accompanied by Nutritionists and medical personnel. Community placement is also one of the activities that gives students knowledge about the role of Nutritionists in the community in providing education about nutrition and healthy living behavior. On this occasion students were invited to go into the community with Nutritionists from the Seyegan Health Center, Mlati 2, Ngemplak 2 and the Nutrition Recovery House (RPG). At the Puskesmas, as students were invited to educate school children about healthy snacks, in the Mlati Health Center 2 students were invited to attend nutritionist counseling for the elderly and nursing mothers. While at the Puskesmas Ngemplak 2 students were invited to counsel breastfeeding mothers and nutrition on toddlers, in Ngemplak students also had the opportunity to visit the Ayah Peduli ASI community, where this community was formed as a form of community empowerment towards exclusive breastfeeding. RPG is one of the programs of the Yogyakarta City Health Office to overcome the problem of children with malnutrition, on this occasion students were invited to find out how the nutrition children lacked care in RPGs to how to make liquid food for malnourished children. On the sidelines of classroom and out-of-class activities, Flinders students have the opportunity to share experiences as students in student activities and educational activities at Flinders University with the UGM Health Nutrition Student Association (HIMAGIKA). During the program the students get an excursion program every weekend, they are invited to visit several tourist attractions in Yogyakarta, such as Kaliurang (lava tour, Ullen Sentallu Museum, Mount Merapi Museum), cultural tours to Tembi Village (batik making, pottery), Imogiri ( mangunan pine forest, permaculture at Bumi Langit Institute), see the sunrise at Borobudur Temple and do cave tubing activities at Pindul Cave and snorkel at Sadranan Beach Gunung Kidul. In order to prepare for the dietisien competency test, the Association of Indonesian Nutrition Higher Education Institutions (AIPGI) held a Review Workshop on the Diet Competency Test Questions. And on this occasion the UGM Department of Health Nutrition, Faculty of Medicine, Public Health and Nursing (FK-KMK) was appointed to host this event which began on 21 July to 23 July 2018. The opening ceremony on July 21, 2018 opened with remarks from the Chairperson of the Department of Health Nutrition FK-KMK UGM, Dr. Toto Sudargo, SKM., M.Kes, who expressed his appreciation for the workshop participants for having the pleasure to attend the holiday to meet the invitation of AIPGI in the UGM FK-KMK. After that, the event was officially opened by the AIPGI Daily Executive, Chairman of the Professional Program Dr. Martalena Purba. He expressed great urgency for the review of the test on this competency competence because September 2018 will be tested to nutrition profession students, at least the target is a set of questions consisting of clinical nutrition, community and food service. After that the presentation of the progress and mechanism of the diets of competency tests by the Secretary of AIPGI, A.Fahmy Arif Tsani, S.Gz., M.Sc.